I'm looking for simple and elegant earrings I can make for Valentine's Day. Have any suggestions? 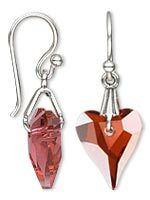 Here's an idea: use the new wild heart pendants from Swarovski with sterling silver findings for a pair of romantic, contemporary, simple to make earrings. Wild heart pendants come in multiple colors and sizes making it easy to pick something for yourself or someone you love. If you're making a gift, you can personalize these earrings by using their favorite color or birthstone color. To make these earrings, you will need two sterling silver ice-pick bails, a pair of sterling silver earwires and a pair of bent-nose pliers or chain-nose pliers. Giving them as a present? Pick out a gift box to present your handmade earrings, and add an extra special touch for your extra special someone.